The recipe my mother used is simple. First, grate some ginger. Next, add sugar or honey and dilute it with water. Finally, boil it for 10 to 20 minutes. That’s all! How simple! Just give it a go! In fact, ginger produces many good effects on our bodies, for example, warming bodies, promoting consumption of fat, helping digestion, preventing from catching a cold, softening stiff shoulder/lower back pain, reducing blood pressure, and so on. Many people eat ginger in dishes on a regular basis. Ginger is always helping us to have a healthy life. We can get ginger from ginger! 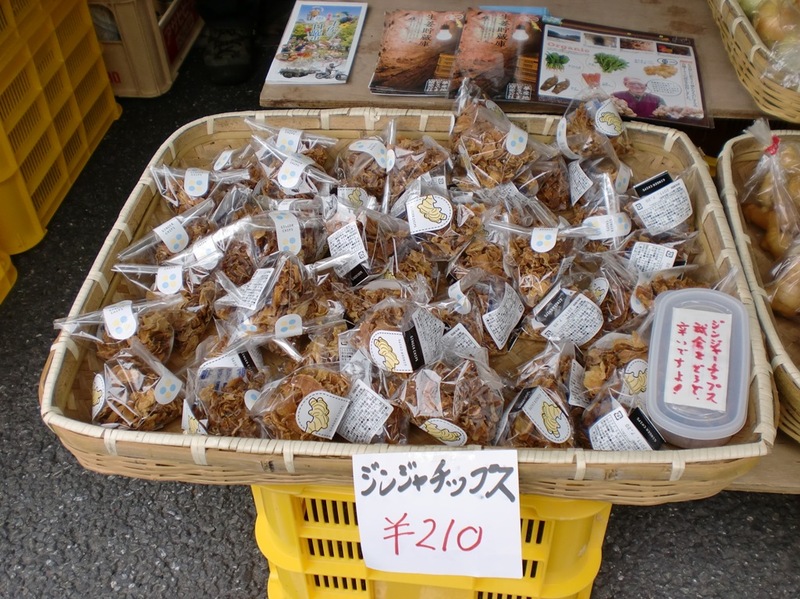 These days, Kochi’s output of ginger is number one in all Japan. Kochi produces about 1100-ton per year and this accounts for 33% of all domestic production of ginger. In the past however, most ginger came from China and farmers of ginger in Kochi faced to the hardship such as aging or lack of successors and as a result the number of giger farmers in Kochi were decreasing. But agrochemical residues over regulatory limits have been found in frozen vegetables produced in China which has resulted in an increasing demand for domestically produced ginger. So why Kochi? The key is the environment in Kochi. There are some nice rivers in Kochi such “Shimanto river” or “Niyodo river”, especially “Kagami river” was approved as one of “100 famed mineral waters” by the Environment Ministry(MOE), so we can get nice water there. And there is good soil in Kochi and the tropical temperature of Kochi is also suitable to grow ginger. These factors are helping ginger-production in Kochi. There is a development corporation named “Yume Sanchi Tosa Yama Kaihatsu Kousha” which has the aim to revitalize regions between mountains in Kochi. It supports local agriculture in concert with institutions like agricultural cooperatives. They produce many kind of organic vegetables like spinach, carrots, garland chrysanthemums, taros and ginger. When this corporation started, there was an urgent need to recover the quality of topsoil which was deteriorating due to the over use of chemical fertilizers and other agricultural chemicals. In fact, some people wrecked their health after eating vegetables produced in such a polluted environment. The solution they took was to introduce BMW technology. BMW means Bacteria, Mineral, and Water. In clean swamps in the forests, water is never polluted no matter how many leaves fall down as long as natural cycle is going well and leaves turn out to be good soil to bring living creatures up. This is because Bacteria and minerals as decomposers, and water melting them purify the soil. After adopting BMW technology, quality of products were totally improved. And still now, this technology is doing well . They are selling ginger ale, ginger jam, and ginger chips in Sunday market. As I mentioned before, they aim to revitalize local area. This selling is one of the way. Mr.andMrs.Kuruma are taking charge of processing ginger from such good environment into ginger ale. Mrs.Kuruma says : I have plenty of confidence in all products with safety materials which are harvested in Tosa even though I and my husband are not local products. They moved to Tosa 10 years ago after their son took agricultural training in Tosa. They love Tosayama and local resources so much. And a lot of people such as the Kuruma family unite tomake their loving local life better. Taking ginger into daily life keeps people healthy. On the other hand, high demand of ginger from Kochi leads revitalization to local areas and makes local people happy. In this way, ginger works good on everybody ! When you feel tired or unwell, please remember ginger from Kochi. I’m sure that they will be your helpful friends and ginger will make you feel gingerly! Sayana, I enjoyed reading this article! I didn’t know about ginger in Kochi and it has some great effect for us. If I catch a cold, I’d like to make ginger tea.Of course I’ll refer to your mother’s recipe! In my hometown, we drink ginger tea also when we caught a cold. I still remember drinking ginger tea was more suffering than what I feel from my cold. Maybe this is the reason why I hate ginger now. Without a doubt, it does work and cure my fever or cold at all the time. Presently, we have instant ginger tea pack that what we have to do is just add hot water. From your article, I knew that Kochi is number 1 output of ginger in Japan. It remind me, the ginger factory nearby our university. I enjoyed your article and had interest in it. I also liked the word “We can get ginger from ginger”! Although I don’t like ginger so much, I’ll try it if I caught cold or felt tired. I feel eating various type of ginger products makes me maintain my health. I like your recipe, Sayana. I will give it a try the next time someone in my family catches a cold. Your article was very well written and very easy to read. Well done.